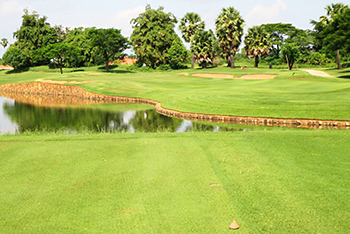 The Angkor course is one of three international-standard golf facilities situated in the Siem Reap province of northwest Cambodia (the other two courses can be found at Phokeethra Country Club and Siem Reap Booyoung Country Club) and it opened for play in 2008. Because the landscape was so flat, a large amount of soil was shifted to create movement in the fairways and so, as a consequence of digging holes to reposition earth around the course, there’s a pond or a lake to be negotiated on each and every one of the eighteen holes on the scorecard. The signature hole is regarded as the 426-yard 15th, a slightly doglegged par four, where the fairway narrows on approach to the green. Water to the left of the fairway then cuts across the front of the putting surface to wrap around the other side of the green, offering a formidable aquatic challenge at this hole. Angkor Golf Resort hosted a professional competition on the Asian Tour in 2012 when the Handa Faldo Cambodian Classic, won by American David Lipsky, was played on the course. Unfortunately, the tournament has so far proved to be a one-off event. The Angkor Golf Resort is located only 10 minutes from the Airport and 15 minutes from downtown. With a par of 72, the course provides for all level of golfers. The Faldo Championship tees play to 7,279 yards, the Blue tees are 6,666 yards and Ladies tees are 5,151 yards. The pins are placed in one of 3 sections on each green and you are advised the position numbers being played on the day. The back of the scorecard has a guide to assist you with which third of the green each pin is placed. The free full colour course guide also gives great advice for each hole and yardages to bunkers. The golf fees are around US$145 including caddy and shared cart. The fairways are typically generous but there is water in play on almost every hole. The course has seashore paspalum grass throughout allowing an exceptional playing surface and an enjoyable round. The bunkering style is impressively bold. The compulsory caddies will offer you all types of advice and they have good spoken English. They are very handy in advising on the subtle undulations on the greens. Siem Reap has some of the most spectacular historical ruins in the world. Adding in a game of golf or two is a great way to mix-up sightseeing, relaxing by the pool and spending some money in a community that needs our tourism dollars. 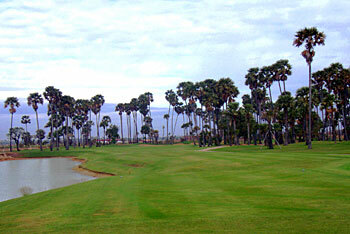 Angkor Golf Resort is a flat and very challenging course. Water comes into play on 17 out of 18 holes and the course length is long nearing 7,300 yards with strategically placed bunkers throughout the course. The beautifully designed contours around the greens are one of the Faldo’s features and are impressive. The greens have plenty of subtle undulations, so your abilities to read the putting lines are tested. Some holes are narrow and lined with high palm trees, which are used in Cambodian national flags. The condition was superb as Paspalum grass made in America was used on the greens and the fairways. The par 4 376-yrd 2nd is a dogleg to the right and a relatively short par 4. Plenty of high palms line the fairway as with the rest of the holes, which resemble the neighboring view of Angkor Wat. Two massive fairway bunkers are positioned on both sides squeezing the fairway. The green is small and elevated with two mounds in the center. The par 4 440-yard 18th is a slight dogleg to the left and a demanding finishing hole. Water runs the entire left side from the tee to the green, thus pressuring both the tee shot and the approach shot. The green is elevated. To read more about Angkor Golf Resort, click here to visit my website. I found the greens to be very true when I played here and putting strokes per green ranged from 0 to 2, with many 1-putts. Overall fairway conditions were good, and bunkers lend shape to the golf holes without causing a lot of trouble.